Home Brands and Products Chanel 808 Lilas D'Or and 814 Silver Pink. 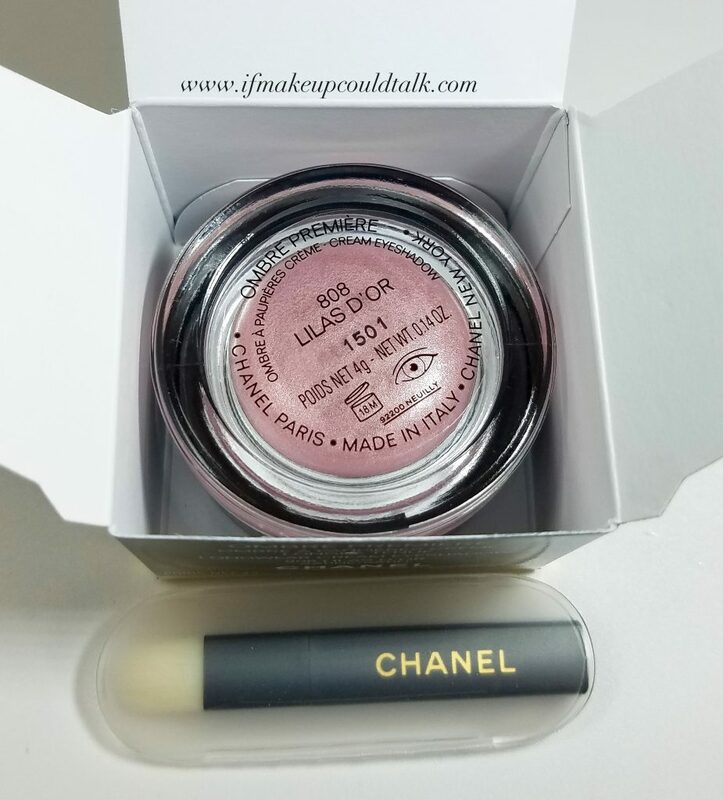 Chanel 808 Lilas D’Or and 814 Silver Pink review. More often than not, in the summer time, I am always reaching for a cream shadow(s). The convenience and ease of use are indispensable when one needs to look polished in no time. 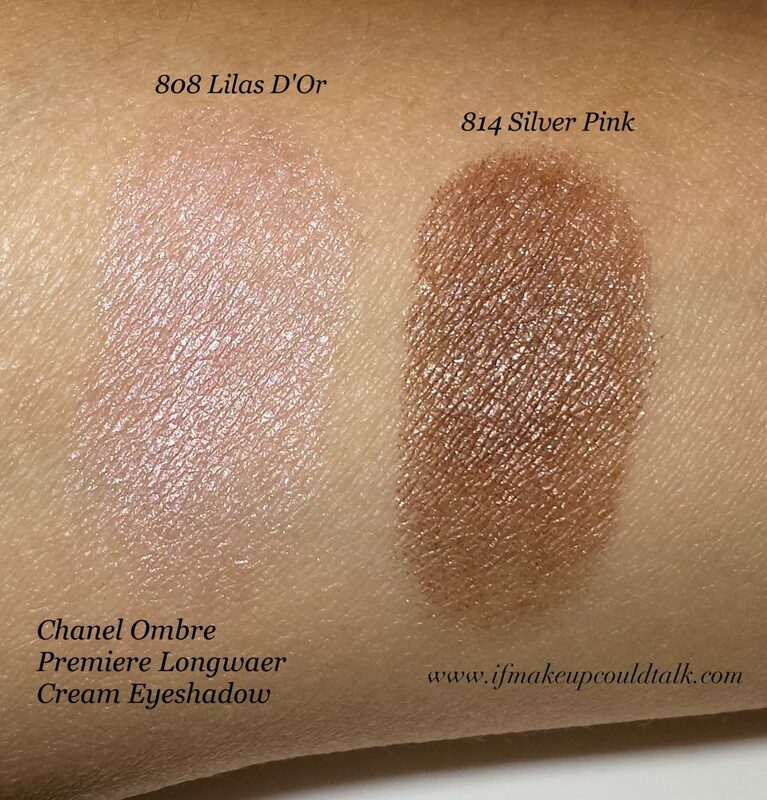 Given my success and adoration for 806 Terre Brûlée and 802 Undertone, Chanel Ombre Premiere Longwear Cream Shadows in 808 Lilas D’Or and 814 Silver Pink ($37 USD/ 4g) prove that a product can look pretty, have utility and be freaking awesome at the same time. 🙂 I hope you enjoy! 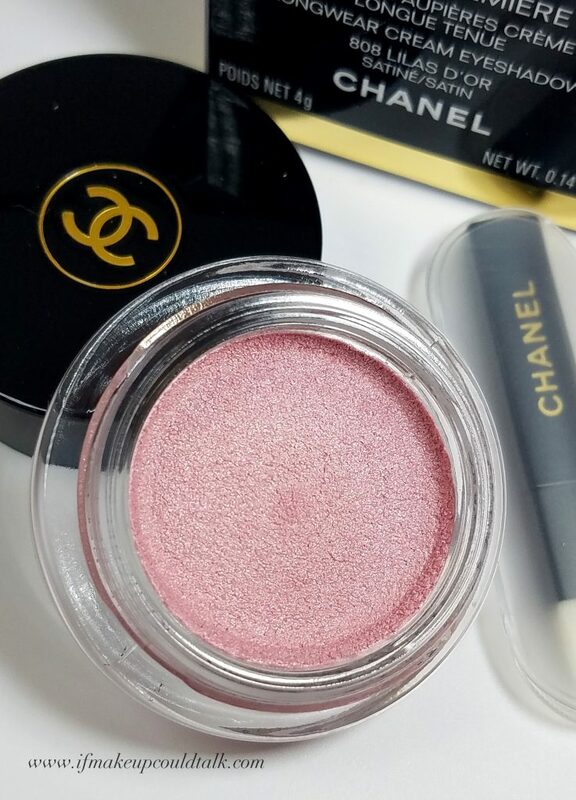 Chanel Ombre Premiere Longwear Cream Eyeshadow 808 Lilas D’Or. Chanel 808 Lilas D’Or (Gold Lilac) was not a color I was instantly drawn to when first exploring the range. The deep pink shade appeared too bright and adolescent for my needs. Oh how wrong I was. Upon closer inspection, the swatch for 808 Lilas D’Or is quite delicate and wearable. After freely swatching this color at a counter, I quickly envisioned myself pairing this lovely with Chanel 806 Terre Brûlée (reviewed here) and its partner in crime for this post, 814 Silver Pink. Lilas D’Or roughly translated, means Gold Lilac. To my eye, the golden notes are not that obvious, but instead a soft champagne undertone provides just the right touch of warmth that keeps Lilas looking modern instead of tittering into Barbie territory. The color applies quite sheerly on initial application and can be built-up easily depending on the brush used and how many layers one desires. Personally, two coats provide just the right amount of rosiness against my brown eyes and olive complexion, but paler complexions/eyes could get away with building-up this shade full force. Chanel 808 Lilas D’Or is very reminiscent of 802 Undertone (reviewed here) in finish and texture. Both colors do not contain shimmer, but a beautiful sheen that remains chic despite the layers applied. Chanel Ombre Premiere Longwear Cream Eyeshadow 814 Silver Pink. Wearing Chanel Ombre Premiere Longwear Cream Eyeshadow 814 Silver Pink on the mobile lid with 802 Undertone on the inner corner (photo taken indoors on a very sunny day). Chanel 814 Silver Pink is one of the most popular colors in the range. This comes to no surprise considering the complex mix of brown, mauve and silver is an unbeatable color combination that looks fantastic against so many complexions. For the most part, 814 Silver Pink applies very sheerly on initial application. 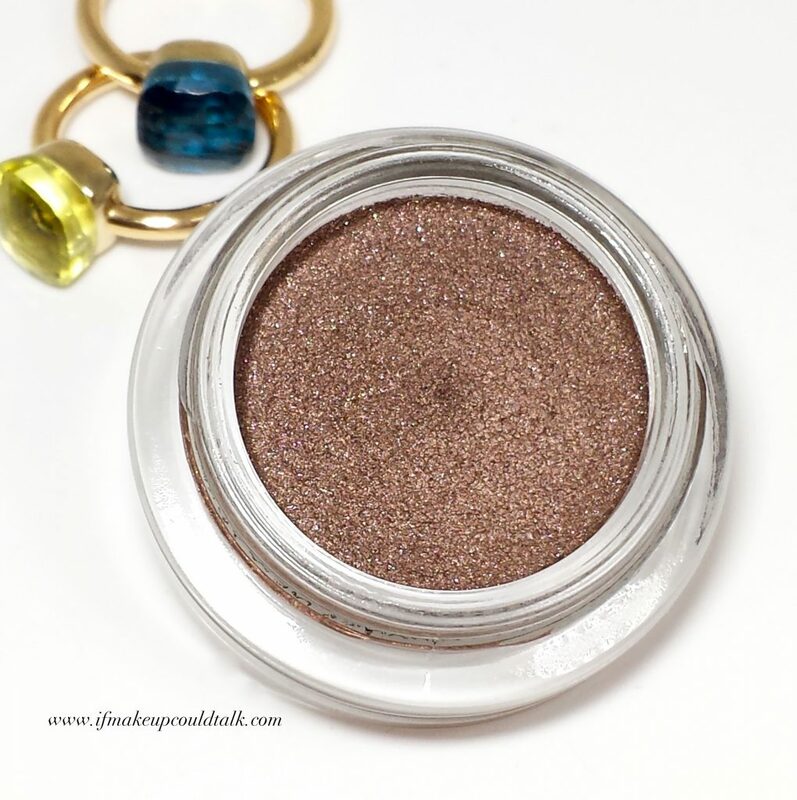 Admittedly, the deep coloring in the pot compared to the sheer application was unexpected, but after researching other bloggers’ experiences, this seems to be the nature of this color. As for the finish, Silver Pink contains the finest silver shimmers. When applied with fingers, the texture is smooth and the shimmers provide just the right amount of interest to an eye look without looking too overdone; definitely, a sophisticated one-and-done color for the professionals in the bunch. On my olive complexion, 814 Silver Pink can shift to purple or brown depending on the lighting conditions and/or layers applied. With that being said, I have yet to wear this color on its own, I prefer to mix or pair this with either 808 Lilas O’r or 808 Terre Brûlée. This rationale pertains more to my personal issues with my deep-set eye sockets, rather than the color itself. Sadly, the older I get, the more recessed my eyes appear, deeper shades, even one as sheer as Silver Pink, tend to create shadows I cannot afford to sport on a daily basis. Chanel 808 Lilas D’Or and 814 Silver Pink–both colors required 3 passes to obtain these results. Wearing Chanel Ombre Premiere Longwear Cream Eyeshadow 808 Lilas D’Or and 814 Silver Pink (photo taken on an overcast day). For the above look, two layers of 808 Lilas D’Or was applied with my ring finger over the entire mobile lid, using Nars crease brush (here), two layers of 814 Silver Pink were then applied on the outer two-thirds portion of the mobile lid, leaving the inner third exposed with Lilas. 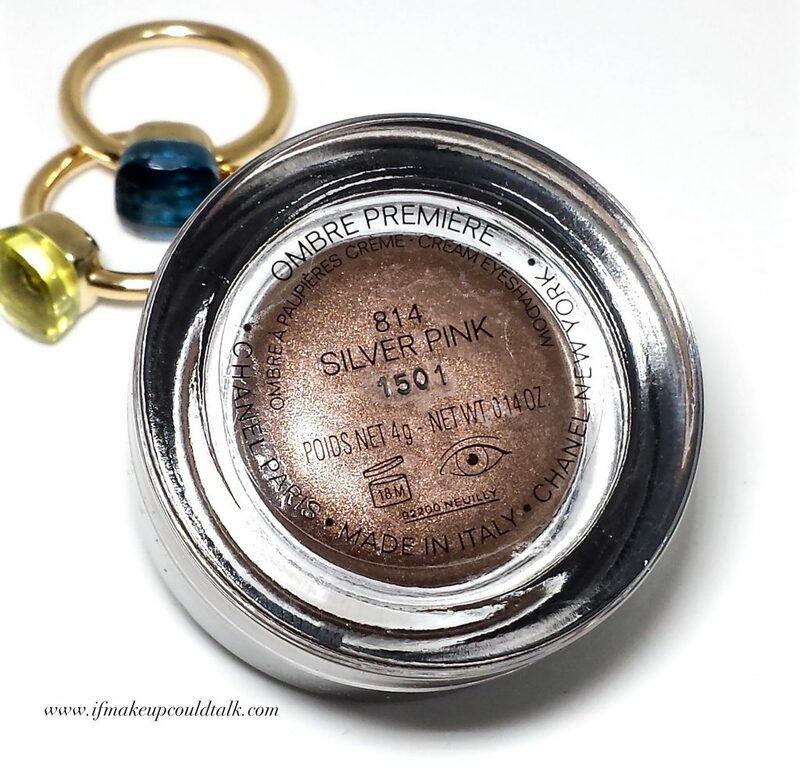 To round out the look, Chanel 808 Terre Brûlée was placed on the lower lash line. This look remained intact for a solid nine (9) hours (longing if I hadn’t removed it), with slight color transfer to my crease area. Oddly enough, the color on my lid seemed undisturbed despite the color migration. Lipstick worn on this day was Jouer Lip Cream in Melon (reviewed here) topped with a light coat of Chanel 140 Amoureux (my fave–reviewed here). A light dusting of 808 Lilas D’Or was also used to highlight the upper lip line. Earrings are Jennifer Meyer leaf earrings in yellow gold. 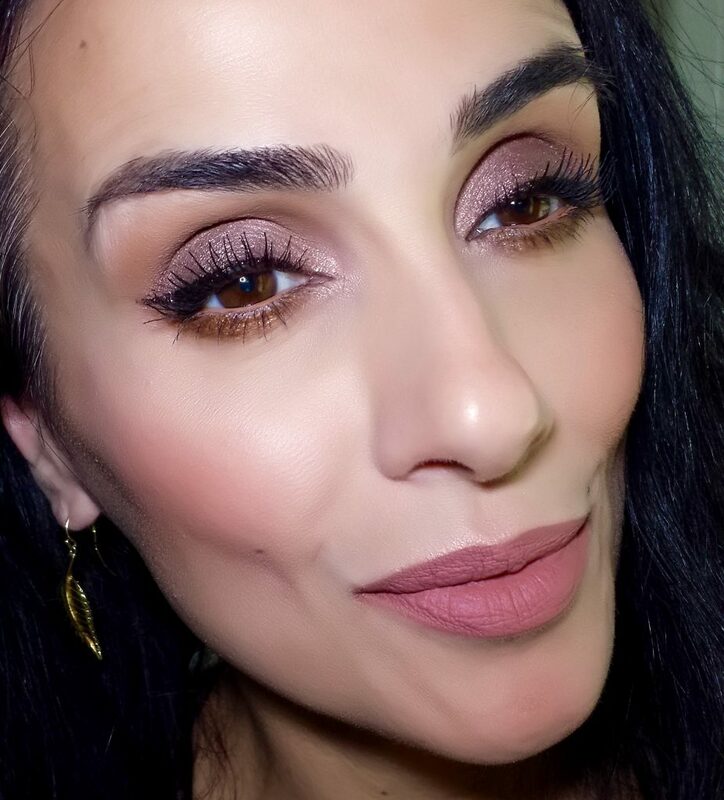 Wearing Chanel 808 Lilas D’Or on the lids and as a cheekbone highlighter (photo taken on a dark cloudy day). 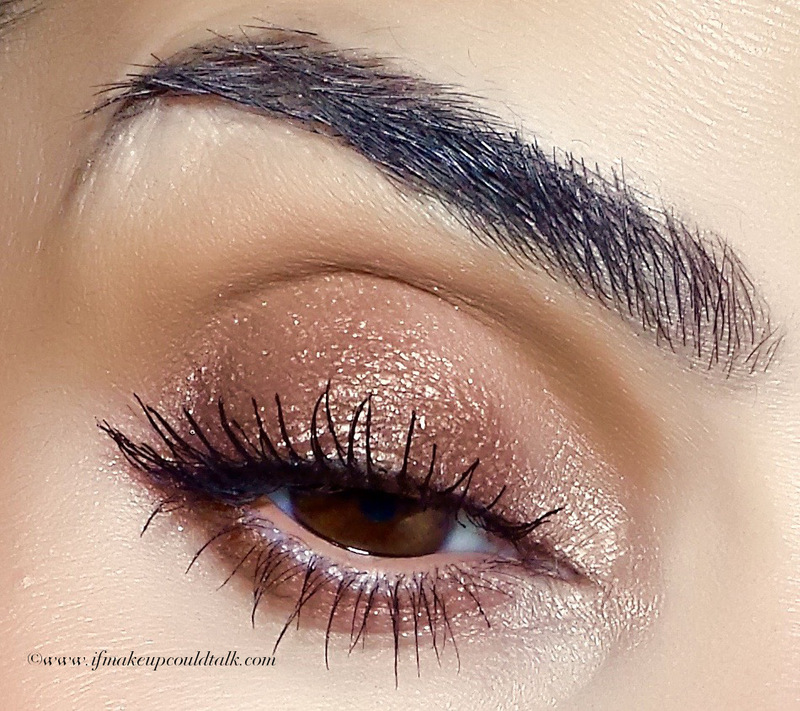 For the above look, Chanel 808 Lilas D’Or was applied on the mobile lid and paired with 814 Terre Brulee along the upper and lower lash line. Utilizing tapping motions, Lilas D’Or was also used as a cheekbone highlighter. This look remained luminous for a solid eleven (11) hours despite the heat and humidity on this day. 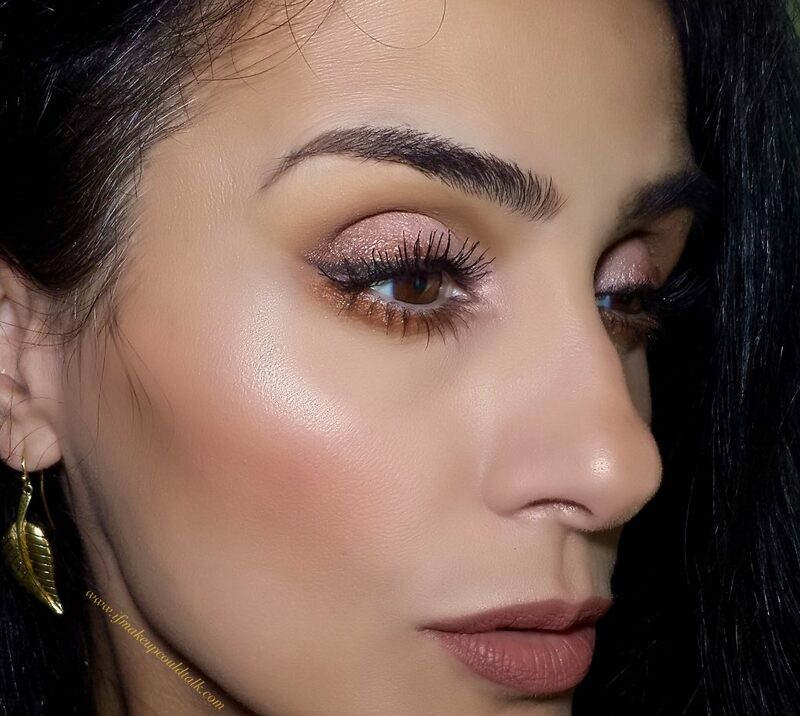 I did experience slight color transfer to my crease area, but for some reason, these results made the look appear even more dewy and attractive…go figure. Lip combo on this day was, Colourpop Brink with Dose of Colors Knock on Wood topped with Estee Lauder Pure Color Envy in 123 Stripped. 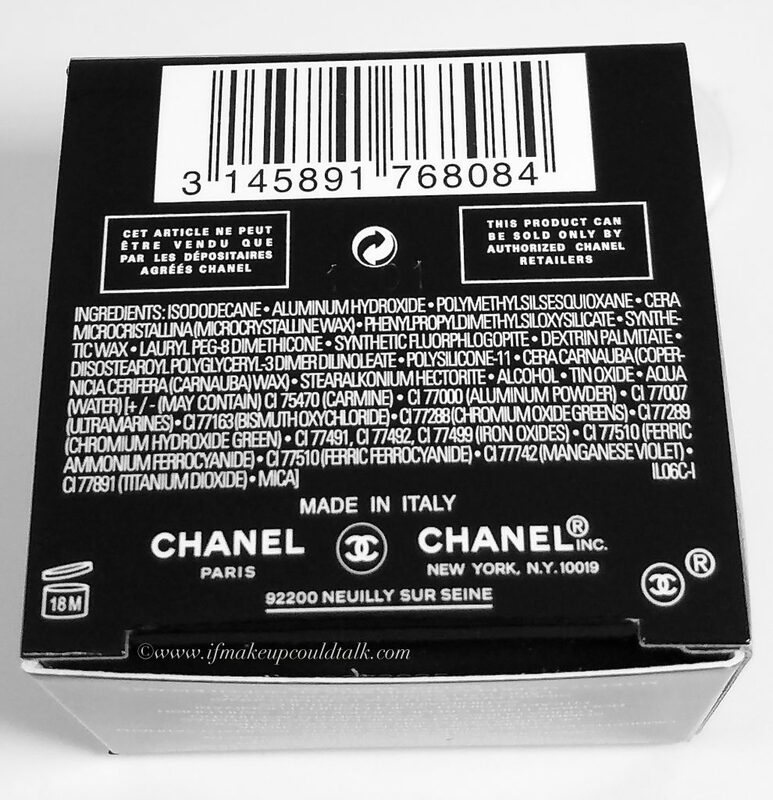 Chanel Ombre Premiere Longwear Cream Eyeshadow ingredient list. 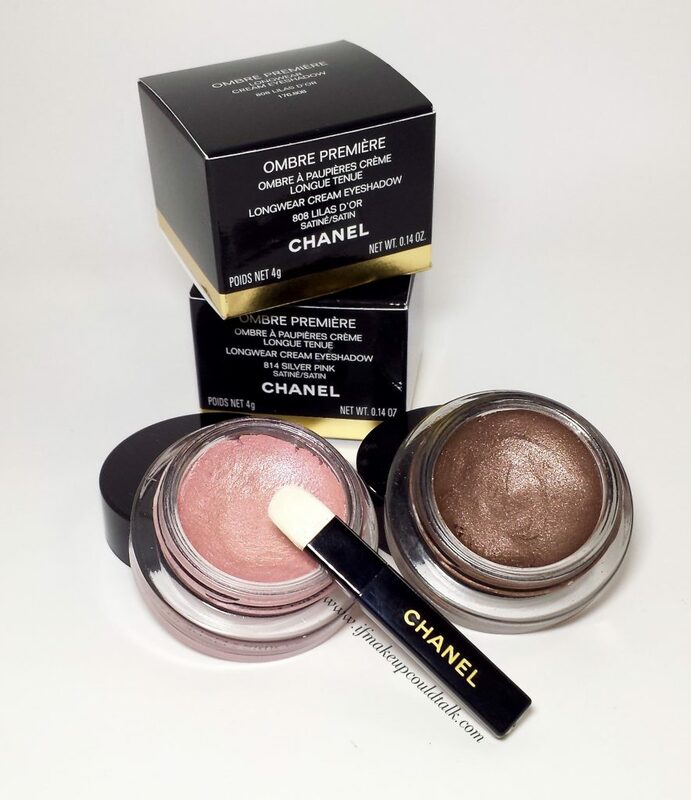 Makeup would tell you Chanel Ombre Premiere Longwear Cream Eyeshadow 808 Lilas D’Or and 814 Silver Pink are another hit for this blogger. The light weight consistency, longevity, versatility, and delicate finish make this purchase a no-brainer. Now my only “problem” is finding the inner strength to stay away from the two limited edition colors: 820 Memory (deep golden brown) and 818 Urban (amazing deep navy). Will you be trying any of the colors in this range? Until next time, be well, stay safe and be happy.